Amgraph Packaging Awarded Mother Parkers Supplier of the Year | AMGRAPH Packaging, Inc.
Amgraph Packaging is honored to be Mother Parkers Supplier of the Year for 2018. Amgraph is the first American supplier ever to receive the distinction, and they are also the first tea packaging supplier to be recognized. The Supplier of the Year honor was established to recognize excellence in quality, delivery, cost, responsiveness, innovation, and engagement. The award recognized Amgraph as being one of Mother Parkers’ most engaged vendor partners across all categories, bringing unique technical expertise, in-depth knowledge of the tea industry, and a genuine passion for customer service to the table at every interaction. During fiscal 2018, Amgraph worked with Mother Parkers on key cost-savings initiatives, and they achieved a 90 percent overall vendor service rating. 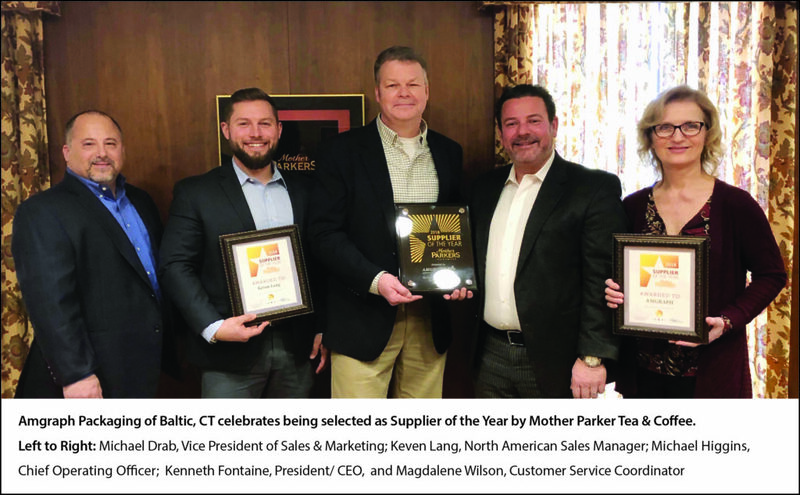 Mother Parkers Tea & Coffee, a fourth-generation family-owned business, is one of the largest coffee and tea manufacturers in North America. The company combines state-of-the-art technology and new product innovation with more than 100 years of quality and service excellence to deliver an exceptional beverage experience in mainstream and specialty coffee, tea, and complementary beverages. For more than 30 years, Amgraph has been a leader in sustainability, making the highest quality flexible packaging and using the most eco-friendly methods available. As technology continually evolves, Amgraph remains in the forefront of the packaging industry in both environmental stewardship and advanced processes. A family-owned business, Amgraph is committed to serving the best interests of their customers, suppliers, and the greater community.